We meet on the 1st and 3rd Tuesday of the month from 14.30-16.30 at the Cube. Explore the joy and satisfaction of following your inner muse. Using glowing paints on silks and special effects we create beautiful art that can be as simple or as intricate as you wish it to be. The colours flow and blend on the fabric and, unless controlled, their movement is unpredictable; resulting in gorgeously atmospheric effects. If the application of paints are controlled they produce a precise image of astonishing clarity and vivacity. The product of a silk painting is more versatile than painting on paper, card or canvas; as a fabric there are many more uses to which your lovely creation can be put. Besides being framed and hung as a wall-hanging or painting, it can also be used on many varied items from cushions to lampshades, scarves to jewellery, cards to book-covers, boxes to handbags, and ties to waistcoats. We explore our own individual artistic ideas, working in pleasant social surroundings on independent projects, with our more experienced artists cheerfully helping newer members with technical advice. The size of the group is limited, but when table space is available we give newcomers a warm welcome. 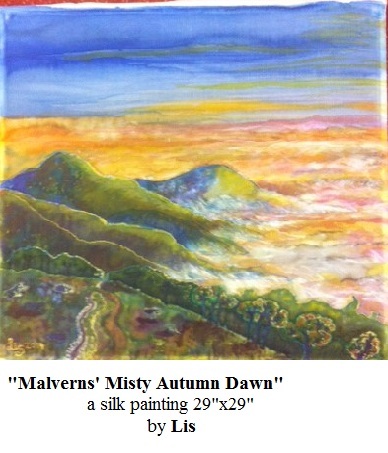 Maralyn Eardley can be contacted if you are a Silk Painting Group member or prospective member, and Lis Dobb-Sandi if you are a Trusteea or Silk Painting Group member. 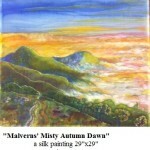 Please click HERE to see the Silk Art Gallery.